Ledum is a prominent remedy for insect bites-honey bees, wasps, fleas especially mosquitoes. Immediately apply Ledum Q. (Mother tincture) and internally give Ledum 6, 30 or 200 every 10 minutes. For mosquito-bites Caladium and Staphysagria are also useful remedies. It is very useful remedy for sharp, stinging, burning pain and swelling, which is of red, rosy hue, after being bitten by honey-bee, red ants. The part is very sensitive to touch. Give Apis 30 or 200 every five minutes. 1 – 2 drops of Arnica Q. applied to a wasp-sting prevents the pain and swelling and in couple of hours the sting is forgotten. Carbolic Acid, is more effective than Apis. It removes pain and burning within few minutes without the need of any other remedy. Give every ten minutes 4-5 doses are enough. This is useful in bites of poisonous insects, scorpion etc. When Ledum, Apis fails to do any good result within 15 – 20 minutes. Give Ars. every ten minutes. This is to be used in cat-bite when there is no improvement from Ledum. Remove the sting by gripping the sting carefully without touching the poison sac above it. 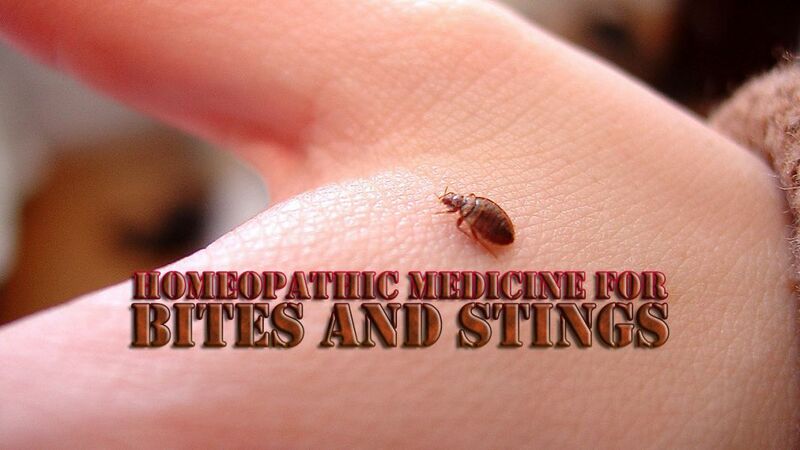 If we are not careful while removing the sting, the entire poison in the sac is likely to be injected. It is also an excellent remedy for bee-stings. Externally, apply mother tincture and internally give 30th potency every ten minutes. In cases of stings of poisonous insects, when even Ars. fails and the swelling looks bluish.